The invention of nylon was the highlight in the field of chemistry in the twentieth century. Engineering and basic science, universities and industry, were fused together as never before to make a dream of innovation come true: to manufacture a totally synthetic artificial silk. Nylon was such an immediate commercial success that it literally convulsed American society in the 1940s, but its inventor, Wallace Carothers (1896-1937), did not live to see this success. He had a scientific career as bright as it was fleeting, more befitting a rock star or a tormented artist. In 1928, the American company DuPont decided to invest in basic science and named Wallace Carothers to lead the research in organic chemistry. Carothers, with a promising academic career ahead of him, left his teaching position at Harvard to take up the challenge put to him by DuPont: manufacture a giant molecule with a weight of more than 4,200 atomic mass units. Through there was no practical purpose to the goal, which was merely set to beat a record, it spurred the researchers to begin developing the chemistry of these macromolecules with very long chains, today called polymers. Carothers succeeded after two years of work. In 1930 he produced a “super-polyester” with a molecular weight of more than 12,000. That same year his team added another success with the creation of the first synthetic rubber (neoprene) and they also began developing new fibers. But mental depression and a turbulent personal life separated Carothers from this line of research for several years. In 1934, Wallace Carothers returned and started another very fertile period as a researcher, peppered with stays in psychiatric clinics. DuPont had this time given him a much more practical task: to make a synthetic silk that was practical for everyday use. Carothers’ team returned to look at some of the super-polymers that they had investigated earlier out of pure curiosity, polyamides; and from these was born nylon, synthesized for the first time on February 28, 1935. The recognition of his great contribution to science was immediate. In 1936, he was elected to the National Academy of Sciences, an honor never before received by an industrial organic chemist. But he could not overcome depression and felt his scientific career was stagnating. 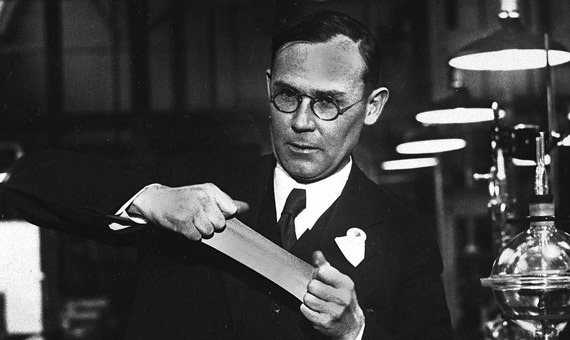 On April 29, 1937, Wallace Carothers committed suicide by drinking cyanide with lemon juice. With his knowledge of chemistry, he knew that taking potassium cyanide dissolved in an acid environment would convert it into a faster and more powerful poison. His daughter was born seven months later and Wallace did not live to see the success of his great invention either. In 1938, DuPont patented nylon and began using filaments in toothbrushes. But its commercial breakthrough came in 1940, in the form of stockings for women. Nylons were cheap, thin and more durable than silk, and after their launch in the US they were selling at the rate of 4 million pairs a day. World War II put a break to this nylon fever. DuPont stopped manufacturing stockings and put its synthetic fiber to use in making parachutes and other materials for the army. During those years there was a black market for nylon stockings and, once the war was over, their return to the stores was tumultuous. DuPont relaunched them with a big promotional campaign, but at first they could not meet demand and shortages of nylons sparked riots in the stores. They were called the “nylon riots.” In Pittsburgh, some 40,000 people lined up to buy 13,000 pairs of stockings, resulting in destructive battles in some department stores. Nylon revolutionized the textile industry, being made available as a luxury item. DuPont was accused of withholding the production of nylon stockings to earn more profits, and protests by women prompted the company to release the patent in order to avoid an antitrust trial. Nylon had also become a strategic material for its military applications, and it was also instrumental in the Apollo space program, being used to make the suits of the astronauts and the flag that they unfurled on the moon. The convulsive history of nylon is now a “fairy tale” of progress for the chemical industry and for science, always associated in the public mind with contamination and toxicity. For Nathan Rosenberg, a professor at Stanford University, the invention of nylon is a clear example of engineering benefiting science, not just the reverse. Rosenberg, an expert on innovation, relates this sequence of synergies that ran from the boom in the automotive industry to the revolution of nylon, in his article for OpenMind: “Innovation: science shapes technology, but is that all?”.